Play a game of concentration – cannabis-style! ALL OTHER DEVICES CLICK HERE TO PLAY NOW! 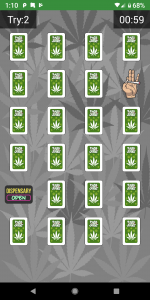 This simple yet addictive game tests your pot-fueled powers of concentration and memory! See how well your blitzed brain performs under pressure. Can you match the cards with their mates or will the MJ muddle your mind? Who cares! The pizza guy is here! The Stoner Memory Test remembers your high score (which is great, because you probably won’t), so you’ll always have a challenge to beat. Earn trophies and share your scores with friends on Facebook. Even better, challenge them to beat your score and see which of your buds is brightest! 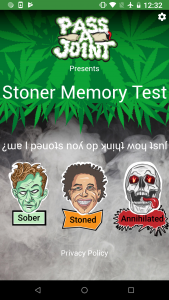 Stoner Memory Test is the perfect adult concentration game for anyone who loves weed, pot culture or just wants to have a blazing good time with friends. Try it now, and pass your cell (and that joint) to the left to see if your friends can hit your high score! Download it now for free, and don’t forget to try our other 420-friendly games, featuring your favorite kind buds — Blitzed Bingo, Pass-a-Joint and our newest nurtured little seed, Budtender: Colorado Dispensary.